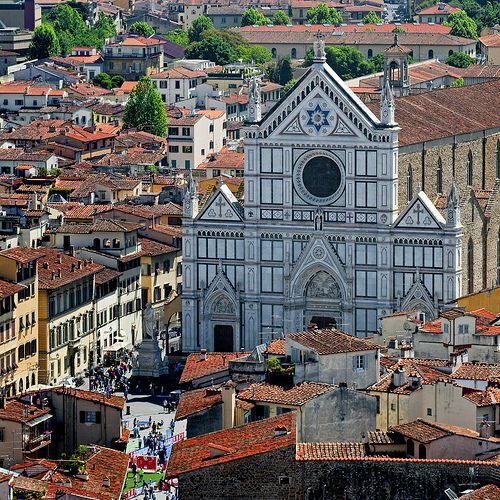 Besides being one of the finest examples of Italian Gothic architecture, the Basilica di Santa Croce is also one of the largest Franciscan churches in the world. Mentioned by Ugo Foscolo in his long and beautiful poem Dei Sepolcri, the Basilica is the burial place of some of the most illustrious Italians; for this reason, it is also known as the Temple of the Italian Glories. Piazza di Santa Croce was constructed on the site of an ancient swamp, basically an island outside the city walls formed by a bifurcation of the Arno River. The Franciscans arrived in Florence around 1226-1228 and built there a small oratory because they wanted to be isolated from the rest of the city. Although unproven, it is almost certain that the splendid Basilica was begun by Arnolfo di Cambio in 1294 and completed in 1385 at the expense of the Florentine citizens. Consecrated in 1443, it started attracting a multitude of worshippers and a square was finally created in order to accommodate the crowds. Besides being one of the largest Franciscan churches in the world, the Basilica di Santa Croce is also one of the finest examples of Italian Gothic architecture; the exterior is characterized by a garish, neo-Gothic and widely criticized façade (designed by Niccolò Matas in the 19th century) and by some bare, triangular, unmistakable tympanums on both sides. The interior appears simple but all the same monumental; the huge central nave represents a milestone on the artistic and engineering path that led to the nave of Santa Maria del Fiore. Mentioned by Ugo Foscolo in his long and beautiful poem “Dei Sepolcri”, the Basilica is an authentic pantheon dedicated to famous Italian artists, musicians and men of letters. Although it had previously been used as a burial place for many illustrious personalities like many other churches, it was only in the 19th century that it became the so-called “Temple of the Italian Glories”. 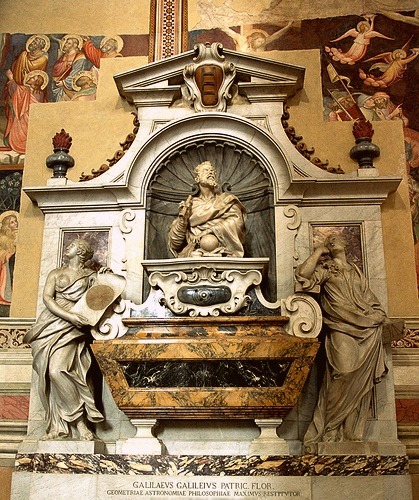 In 1871 Ugo Foscolo – who had expressed the wish to be buried next to Michelangelo and Galileo – was finally laid to rest in Santa Croce even though he had died in England forty-four years before; after his entombment, the remains of Gioacchino Rossini, Leon Battista Alberti and Vittorio Alfieri were also brought there and the greatest sculptors of that time created the astonishing tombs and cenotaphs that we can still admire today in the side aisles. 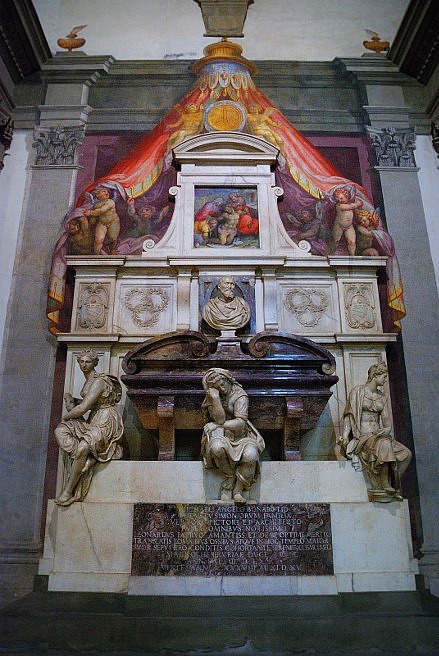 The church floor accommodates another 276 tombstones, including that of Lorenzo Ghiberti; Leonardo Bruni, Carlo Marsuppini, Gino Capponi and Niccolò Machiavelli are buried in the proximity of the walls. 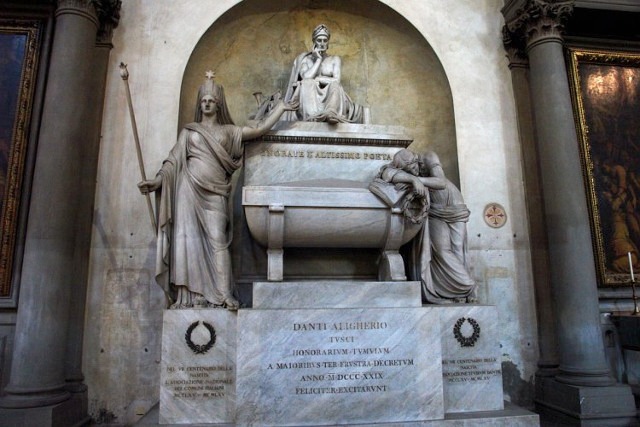 Every good Florentine knows there is a majestic tomb in Santa Croce still waiting for Dante Alighieri's body... do you know why? In 1302, as a result of political disagreement with Pope Boniface VIII, the Supreme Poet was permanently barred from public office, ordered to pay a large fine and banished from Florence for two years. When he refused to pay the fine, he was sentenced to be burned at the stake and that's why he managed to escape to Ravenna, where he died and was buried in 1321. Seventy-five years after his death, the Florentines argued that they should have had Dante's remains back, but Ravenna firmly refused... He's still there, far from the city he had loved so deeply, “mother of little love”... Can we honestly blame Ravenna for all our mistakes? 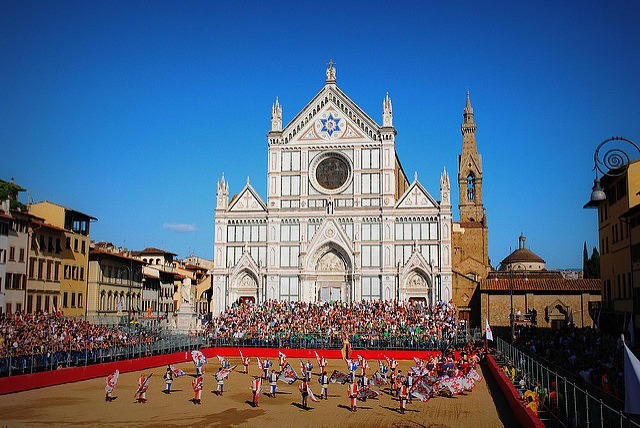 The Basilica di Santa Croce is also very well known for its yearly “Calcio storico” or “Calcio fiorentino”, an early form of football that is thought to have been born right in front of it, in the first half of the 16th century. According to the facts, the troops of Charles V had besieged Florence in the summer of 1529 and the citizens - exhausted but not defeated – decided to show the scorn they felt by improvising a football game, with a group of musicians playing on the roof of the Basilica... 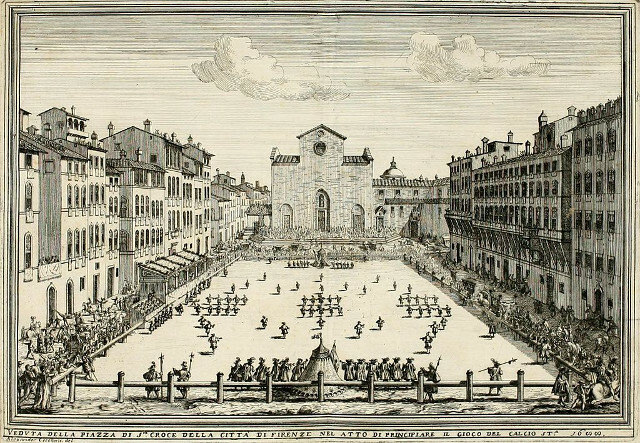 This famous match took place on February 17, 1530. 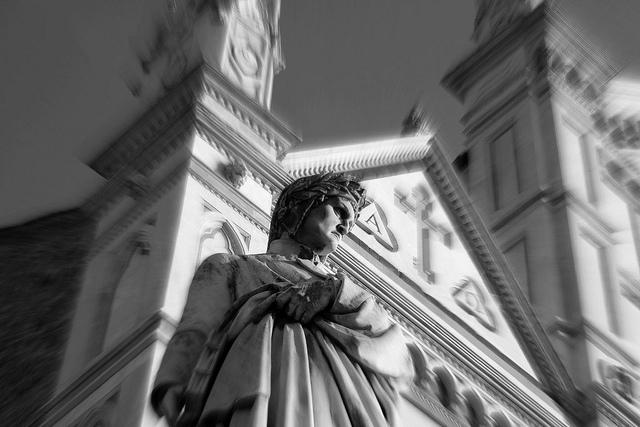 Santa Croce, of course, is just one of the many treasures that you can visit in the Cradle of the Renaissance. 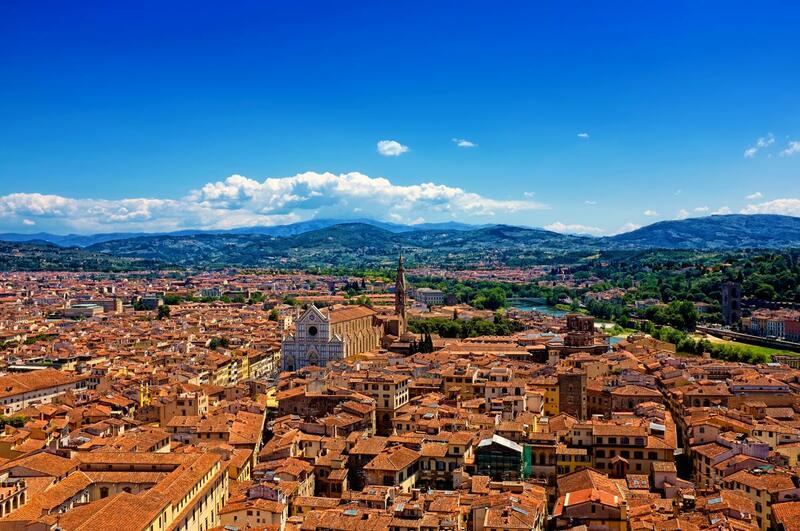 This truly unique Florence in one day sightseeing tour gives you the opportunity to get a glimpse of the other top tourist attractions. 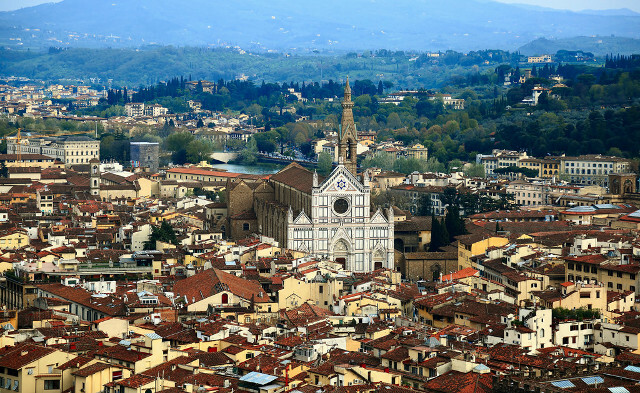 Have a very special time in Florence!